The latest drug abuse trend for youths? Over-the-counter cough and cold medicines, available everywhere from drug stores to convenience stores. Police and doctors tell USA Today that medicines such as Robitussin and Coricidin are becoming more popular as recreational drugs for children as young as 12. There have been dozens of overdoses, and at least five deaths. In the past, some youths would guzzle cough syrup to get high from alcohol and codeine, but most cough and cold medicines no longer contain alcohol, and those with codeine are only available by prescription. However, dextromethorphan, or DXM, a cough suppressant, can produce hallucinations and a loss of motor control, similar to PCP, and DXM is used in more than 120 non-prescription medicines. In fact, the tablet forms of these medicines provide far more potent doses of DXM than their liquid counterparts. There are even Web sites that tell kids how much someone of their weight should take to get high. 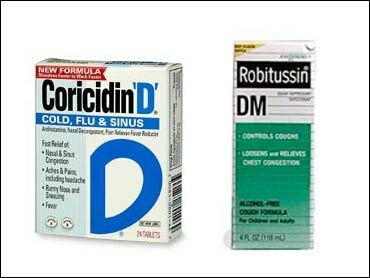 One site has a warning that Coricidin HBP Cough & Cold Tablets, known as "Triple C's," are not a safe source for DXM, because it has another drug in it that may be harmful. Instead, the site advises using Robitussin Maximum Strength cough syrup or a gelcap that contains only DXM. Even that, the site says, isn't safe, just safer than Coricidin's pills. DXM is "easy to get ... and there's a lot of information about how to get high on it on the Internet," Charles Nozicka, medical director of pediatric emergency medicine at St. Alexius Medical Center in Hoffman Estates, Ill., west of Chicago, told the paper. He said he is now seeing as many as four cases a week. That's because experts say DXM overdoses often occur in clusters, as news of the drug spreads through middle and high schools in a community. "It's something people aren't really informed about yet. The parents we've dealt with so far are pretty much in shock," Cpl. Joseph Scott of the Collier County, Fla., sheriff's office said. Two rounds of overdoses there sent four students to the hospital. "It seems right now it's mostly the younger kids." Some drug stores are restricting access to cough and cold remedies now. Coricidin tablets at the Aurora Pharmacy in Merrill, Wis., are now behind the counter, "Where we can keep an eye on it," said pharmacist Jim Becker, after two teenage girls and two 20-year-old men overdosed on DXM earlier this year. Drug manufacturers say they sympathize with the concerns, but are resisting efforts to restrict customers' access to their products. "The vast majority of people take them responsibly," said Fran Sullivan, of Wyeth Consumer Healthcare in Madison, N.J., which makes Robitussin. "As a medicine, it works hands-down, so we want people to be able to use it if they need it." Instead, Wyeth is making some of its packages containing DXM large enough to make them difficult to stash in backpacks or pockets. Schering-Plough doesn't plan to eliminate DXM from its non-prescription cough and cold medicines. "Reformulating our product is not going to make the abuse issue go away," Schering-Plough spokeswoman Mary-Fran Faraji told USA Today. "Our product is safe and effective when used as directed." And the alternatives to DXM are worse, she said. DXM is a synthetic drug similar to morphine. It was approved by the Food and Drug Administration as a cough suppressant in 1954. It began to replace codeine in cough syrups in the 1970s. After a series of overdoses in the Detroit area in August, the federal Drug Enforcement Administration issued an alert that warned parents, schools and local communities about an "escalation" in DXM abuse. DEA special agent David Jacobson in Detroit that federal drug enforcement analysts usually can forecast regional trends in drug use, based on geographic patterns. But "Robotripping" came out of nowhere. "Law enforcement hadn't heard about it, but all the kids had," Jacobson says. As he and others in the community asked around, they found that DXM abuse "was not only out there, but it was out there more than we thought."